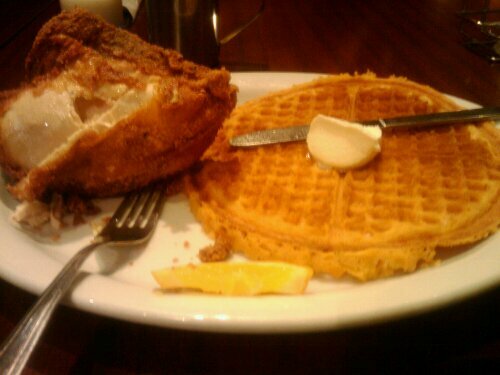 YUM: Chicken and waffles at Gussie's! So, Erl recently challenged me to put together a list of “Top Foods in Your Town.” I was impressed with her list, and got excited to think about my list, too. And then, I stalled. When I was living in Portland, I could name a dozen items that would live on such a list in an instant. I could even probably name a dozen in a given category. But when it came to San Francisco, I balked. I could think of some good meals I’ve had, but could I think of a full, interesting list? No. That depressed me to no end — have I really not done that much good eating in San Francisco? The steaks from Marin Sun Farms. Especially that filet mignon. In the spirit of discovering new things, I encourage Stepho, Love Letters to SF, Very Very Tasty and Not So Plain Jane to share their lists, too! Hooray! I, too, very much enjoyed some of those ho-made items. Thanks for playing!